Brittany's first EarthCache is a short walk into the woodland North of the 'Moulin du Chaos' Although not suitable for wheelchairs, the cache can be reached by buggies (strollers). An interesting geological formation, often associated with granite outcrops are Logan or rocking stones, sometimes called Logans. The exact formation of these stones is the subject of several theories but it is generally accepted that Logan stones on the Tors of South West Britain were formed through selective weathering (wind, frost and rain) of granite rocks, until a part has become disjoined from the parent-rock and is pivoted upon it. Before the nineteenth century it was believed that the ancient Druids had constructed them and their strangeness has long been thought to give them supernatural associations and made them a focus for witchcraft. Even the origin of the name “Logan” is not well understood. 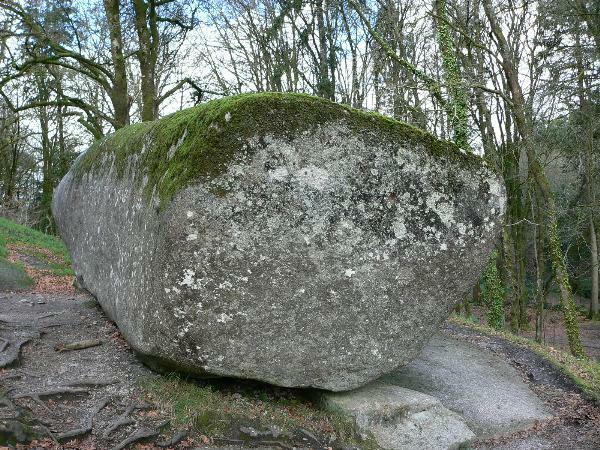 It may come from the English dialect ‘log’ which means to rock (in some parts of Britain the stones are called logging stones) It is also thought the word may have a link with Danish ‘logre’, to wag the tail, which could suggest a Norse origin. Others have suggested that the name may come from a Cornish use of the verb ‘to log’, used to describe the rocking action of a drunken man. 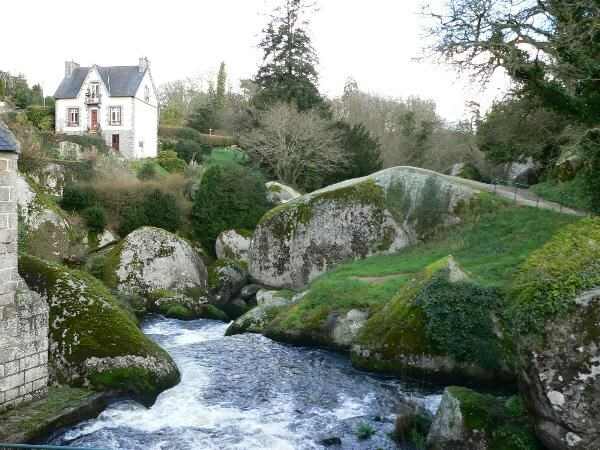 The coordinates given are for the well-known rocking stone in woodland at HUELGOAT in Brittany, Northwest France. 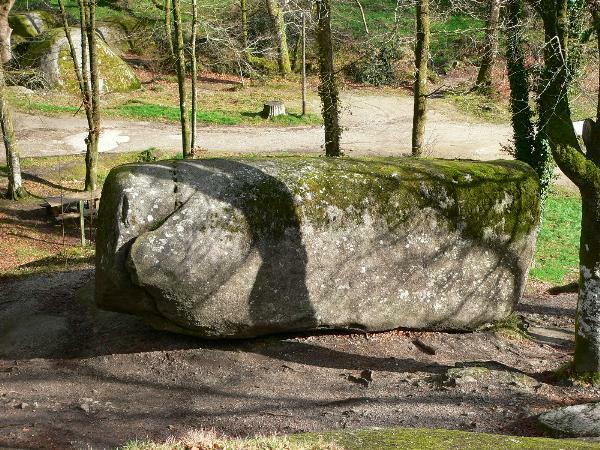 This granite stone, called La Roche Tremblante, (the trembling rock) is larger than a family car and a single person can rock it if they know the exact spot on which to push. Local children often watch visitors trying to rock the stone and, when they give up, will divulge the secret for a few cents. 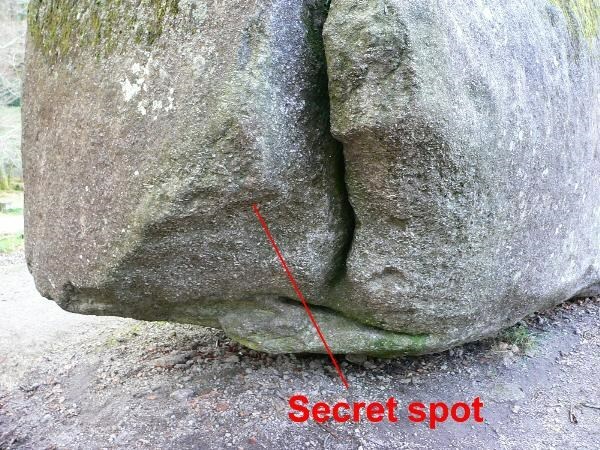 The secret spot is also shown in one of the photographs below. Email your answers A-E to me using this link or via the profile. When you receive a confirmatory reply you may log the cache and include your photograph with the log. Under the new guidelines, a photograph can be requested but specific detail cannot be required. Consequently your photograph can be just a general photo of the site. However a personal touch such as your GPSr (or yourself/member of your team!) in the photo makes it much more interesting. A final word of warning - it is said that if a woman touches a logan stone nine times at midnight, she will become a witch!!! 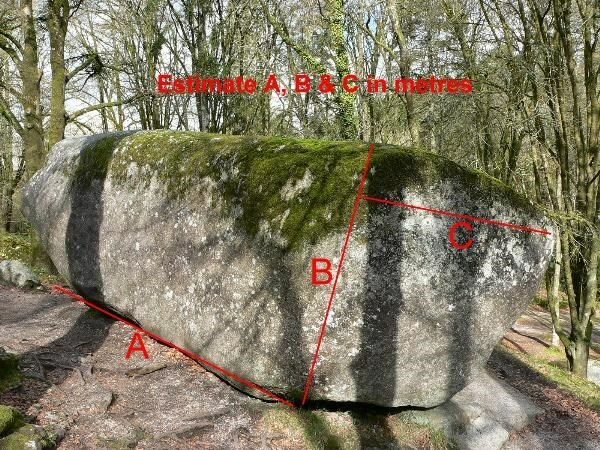 E) en conclusion, étant donné qu'un mètre cube de granit pèse environ 2.75 tonnes, calculez le poids approximatif de la pierre à la tonne la plus proche (La réponse a accepté +/- 30 tonnes) d'email admis vos réponses A-E à moi ici ou par l'intermédiaire du profil. Quand vous recevez une réponse confirmatoire vous pouvez noter cette EarthCache et inclure votre photographie avec la notation. Un mot final de l'avertissement - on lui dit que si une femme touche une pierre "Logan" neuf fois à minuit, elle deviendra une sorcière !!! ChaosSome of the other giant weathered boulders nearby. Secret spotThis is the area in which to push upwards to get the stone to rock.